Excerpt from Its Your Money So Take It Personally®, Chapter Three: Ice breaker on how to talk to elders about $. Excerpt from It’s Your Money So Take It Personally®, Chapter Three: Parental $ perspective through open talks. Excerpts from It’s Your Money So Take It Personally®, Chapter Three: Managing generational assets. New year brings changes for your Flexible Spending Account money. Reducing the amount of money you spend on prescription drugs. The mindset needed to when searching for affordable health insurance. The heart of money matters: questions couples should ask each other to get a snapshot of money habits. The heart of money matters: credit reports, money pots and choosing the family CFO – how your money life will be. The heart of money matters – questions couples should ask of each other to get a picture of money habits and plans. The heart of money matters – keeping a financial focus as a couple. The heart of money matters – helping couples get closer to each other through joint money goals. How middle income Americans can avoid living paycheck-to-paycheck. How to save money on your water bills. Ways to pay for college – look first at federal loans. The state of your wallet – how to find a new comfort level/zone with your money. Why no refund check should be your goal when it comes to taxes. Figuring out how much to withhold from your paycheck – need help? Black History Month: Black is beautiful but why being in the black is better and necessary. Black History Month: Why women of color can’t afford bad money habits anymore. Black History Month: What makes a good financial state of mind and why we must teach our children about money. Black History Month: African-American women’s generosity can lead to personal financial problems. The importance of having an integrated (rather than trying for a balanced) money mindset. Statistics show how the financial future of women is changing. For many working women – retirement often means another full time job. How a good home inspection can save money on your energy bill. The physical and fiscal value of having carbon monoxide detectors in your home. March is Women’s History Month. How women can lead the way to a recovery mindset from the recession. 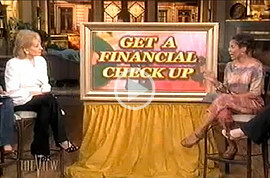 Reminders on how to stretch your paycheck and get some financial stability. Credit card lessons for your college student to better manage plastic. Playing the rebate game – is it worth it? Rebates – here’s how to get them to pay off. Phony tax email is NOT from the IRS – be warned! The cost of puppy love – pet owner expenses and how to reduce them. The cost of puppy love – pet owner costs when adopting from shelters. Transition health insurance as you leave corporate America and become self-employed. What you need to do with retirement savings when switching jobs. Changing and adjusting to life’s transitions. Boomer stress management is good for the bottom line. Finding a good financial planner – what to look for and what to ask. Baby Boomers have good reason for financial concern; what to do about shoring up retirement money. Teaching young children about saving and the importance of sharing (philanthropy). Going energy efficient green at home puts more green (money) in your wallet. Creating a family financial literacy environment to wealth building. Knowing what kind of saver you are – helps with the discipline of creating savings. Frequently asked questions: college versus retirement savings; importance of an emergency savings account; loaning money to your adult children; ease of online banking. Frequently asked questions: how to payoff mortgage faster; what to do with 401k savings when changing jobs; tips for a happy marriage – financially. Frequently asked questions: financial planner necessary for a health financial life; yes, there’s such a thing as ‘good debt’. Personal core values are good money values too. A basic concept for getting your family in a financially literate state of mind. A definition of ‘wealth building’ and why it’s attainable. Tips from industry insiders for getting the best value for your gasoline dollars. The value of making reading fun for small children: Part 1 – One and five year olds. Ways to make reading and asset/fun for children ages 3-5 years old. How to figure out if and when you have enough money to retire: It takes discipline: Questions to ask and things to consider. How to know if you have enough to retire – if you’ve gone through a divorce. Ways to save loose change by changing loose habits. Allowances: should they be tied to chores? Retirement goal – one million dollars? If you’re 25 now here’s how much you need to save each month to meet that goal. The assets of working from home add up. Widowhood requires very specific money management decisions. Ways single parents can save money. Why African-Americans and Hispanic-Americans are in the midst of a wealth gap. Balance your checkbook; integrate family and work demands. What you need to know about money in these post-recession times. It’s your money so take it personally. Finding your passion and the money to afford it. Pt 1 – Personal background that gave me my values. Finding your passion and the money to afford it. Pt 2 – Core values about money and life. Finding your passion and the money to afford it. Pt – 3 Importance of curiosity and re-invention regarding money. Grocery savings. Part 1 – take a list, plan menu and use coupons. Grocery savings. Part 2 – loyalty programs, buy generic, grown own veggies. Financial mindset for the entire family. How what you don’t know can hurt you financially. Family businesses. What’s needed to make them successful. Term life insurance for Moms, Pt 1: why it’s important, what it can fund and how to compute how much you need. Term life insurance for Moms, Pt 2: why many women don’t have it. Dancing on the debt ceiling. Pt 1 – what it is. Dancing on the debt ceiling. Pt 2 – options available to fix the problem. Dancing on the debt ceiling. Pt 3 – what if scenarios and how it could hit everyday Americans’ wallets. Stock market meltdown. Part 1 – Warren Buffet’s outlook regarding a “double dip recession; tips on how to weather the storm. Stock market meltdown. Part 2 – Why scary times can be profitable times; more tips on how to weather the storm. Stock market meltdown. Part 3 – Black Americans wealth building misperceptions; mutual goal for all baby boomers regardless of ethnicity. Market gyrations – instead of panic make a strategic plan. “Strange Money” – a book that gives definitions about money so kids understand. Money and kids: allowances, chores and saving. Picturing retirement’s new reality – for young and older workers. The history of retirement money. Part 1 – How it began. The history of retirement money. Part 2 – The most recent changes. The cost of owning a pet. Pt 1 – Consider adopting – it’s cheaper. The cost of owning a pet. Pt 2 – Pampering your pet and your wallet. Common scams and the red flags to help you avoid them. Going on a debt fast and how to do it. Teaching a teenager about money. Part 1 – The importance of getting a part-time job. Teaching a teenager about money. Part 2 – The importance of having a budget. Historical references to help people recover from the recession in a sustainable way. Baby boomers and retirement. Pt 1 – Little money saved? You’re not alone. Baby boomers and retirement. Pt 3: Things to do to shore up a late start saving for retirement. Baby boomers and retirement. Pt 4: Things to do to shore up late start savings for retirement – strategy and skills. Practical ways for solo or small business owners to save money. How to avoid a post-holiday financial hangover. Pt 1 – Who is on your gift giving list? Refine it. How to avoid a post-holiday financial hangover. Pt 2 – Shopping early and shopping online. How to avoid a post-holiday financial hangover. Pt 3 – Set a budget and stop when you reach your set amount. It’s your money so take it personally. The premise. It’s your money so take it personally. The protocols. It’s your money so take it personally. Getting smarter. It’s your money so take it personally. Chapter 1 – The circumstances. 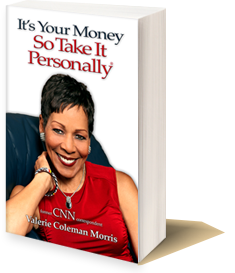 Its’ your money so take it personally. Chapter 1 – The data gathering. It’s your money so take it personally. Chapter 1 – Recession’s silver lining? Money missed takes rather than mistakes.